"I am the last, closest to ground zero (800 meters from hypocenter), living survivor of Hiroshima atomic bomb of August 1945. Many of the tens of thousands of victims there tragically perished from an unfamiliarity of how to protect themselves from the unique effects of a nuclear bomb's flash, blast and radiation. As a US citizen living in middle America today I see a hauntingly similar vulnerability growing among the general public here ever since Civil Defense was discontinued after the Reagan Cold War era. The 'Good News About Nuclear Destruction' is that if all Americans were trained again in the Civil Defense basics of what to do and not do if nuclear weapons were ever unleashed again, we could instantly make all nukes 90% less lethal. Ideally, while I'd like to see a world free of nuclear weapons someday, in the meantime we should all embrace rejuvenating public Civil Defense to greatly minimize their lethality." 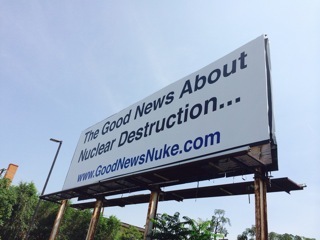 What possible 'good news' could there ever be about nuclear destruction coming to America, whether it is Dirty Bombs, Terrorist Nukes, or ICBM's from afar? In a word, they are all survivable for the vast majority of American families, IF they know what to do beforehand and have made even the most modest of preparations. Tragically, though, most Americans today won't give much credence to this good news, much less seek out such vital life-saving instruction, as they have been jaded by our culture's pervasive myths of nuclear un-survivability. Most people think that if nukes go off then everybody is going to die, or it'll be so bad they'll wish they had. That's why you hear such absurd comments as; "If it happens, I hope I'm at ground zero and go quickly." This defeatist attitude was born as the disarmament movement ridiculed any competing alternatives to their ban-the-bomb agenda, like Civil Defense. The activists wanted all to think there was no surviving any nukes, disarmament was your only hope. The sound Civil Defense strategies of the 50's, 60's and 70's have been derided as being largely ineffective, or at worst a cruel joke. Since the supposed end of the Cold War in the 80's, most Americans saw neither a need to prepare, nor believed that preparation would do any good. Today, with growing prospects of nuclear terrorism, and nuclear saber rattling from rogue nations, we see emerging among the public either paralyzing fear or irrational denial. People can't even begin to envision effective preparations for ever surviving a nuclear attack. They think it totally futile, bordering on lunacy, to even try. Ironically, the disarmament activists legacy, regardless their noble intent, has rendered millions of Americans even more vulnerable to perishing from nukes in the future. The biggest surprise for most Americans, from the first flash of a nuke being unleashed, is that they will still be here, though ill-equipped to survive for long, if they don't know what to do, and not do, beforehand from that very first second of the initial flash onward. For instance, many could readily survive the delayed blast wave via the old 'Duck & Cover' tactic, and that is very good news, IF they knew to do it quick as the flash appeared. Unfortunately, most don't, and even fewer know how to later survive the coming radioactive fallout which could eventually kill many times more than the blast. However, there is still more good news possible, as well over 90% of those potential casualties from fallout are avoidable, too, IF the public was pre-trained through an aggressive national Civil Defense educational program. Simple measures taken immediately after a nuclear detonation, by a pre-trained public, can prevent agonizing death and injury from radiation exposure. The National Planning Scenario #1, an originally confidential internal 2004 study by the Department of Homeland Security, examined the effects of a terrorist nuke detonated in Washington, D.C.. They discovered that a 10 kiloton nuke, about 2/3rds the size of the Hiroshima bomb, detonated at ground level, would result in about 15,000 immediate deaths, and another 15,000 casualties from the blast, thermal flash and initial radiation release.1 As horrific as that is, and even without 'Duck & Cover', the surprising revelation here is that over 99% of the residents in the DC area will have just witnessed and survived their first nuclear explosion. Clearly, the good news is most people would survive that initial blast. The good news here, that these much larger casualty numbers from radioactive fallout are largely avoidable, too, only applies to those pre-trained beforehand by a Civil Defense program in what they need to do before it arrives. Today, lacking any meaningful Civil Defense program, millions of American families continue to be at risk and could perish needlessly for lack of essential knowledge that used to be taught at the grade school level. The public at large, businesses and all our children's schools, urgently need to be instructed in Civil Defense basics again. Like how most can save themselves by immediately employing the 'Duck & Cover' tactic, rather than just allowing an impulsive rush to the nearest windows to see what that 'bright flash' was across town, just-in-time to be shredded by the glass imploding inward from that delayed shock wave blast. Most also don't know, even when caught in the open, just lying flat, reduces by eight-fold the chances of being hit by debris from that brief, three second, tornado strength shock wave blast that, like lightning & thunder, could be delayed arriving anywhere from a couple seconds to 2 minutes after that initial flash. 'Duck & Cover', while under appreciated by most Americans, has long been known as a simple and effective shock wave blast life-saver, even as early as Hiroshima (15 KT) and Nagasaki (22 KT). Tsutomu Yamaguchi, 29, Mitsubishi ship designer who died in 2010, aged 93 (Trumbull pp. 28 and 109): "'Suddenly there was a flash like the lighting of a huge magnesium flare,' Yamaguchi recalls. The young ship designer was so well drilled in air-raid precaution techniques that he reacted automatically. He flung his hands to his head, covering his eyes with his fingers and stopping his ears with his two thumbs. Simultaneously he dropped to the ground, face down. ... 'As I prostrated myself, there came a terrific explosion' ... [The left side of his face and arm facing the fireball were burned, and he returned to Nagasaki, experiencing the second nuclear explosion on the sixth-floor of the headquarters office of Mitsubishi.] Spelling out the danger of flying glass, he urged them to keep windows open during an air-raid alert, and at the instant of the flash to seize at once upon any shelter available ... the second A-bomb confirmed young Yamaguchi's words, exploding in a huge ball of fire about a mile away. Yamaguchi's lecture [just an hour earlier!] ... was not lost upon his colleagues. With the young designer's words still fresh in their minds, they leaped for the cover of desks and tables. 'As a result,' said Yamaguchi, 'my section staff suffered the least in that building. In other sections there was a heavy toll of serious injuries from flying glass'." Masao Komatsu, 40, was hit by falling beam in a Hiroshima warehouse and was on board a train in Nagasaki when the bomb fell (Trumbull, p101): "...the interior of the coach was bathed in a stark, white light. Komatsu immediately dived for the floor. 'Get down!' he screamed at the other passengers. Some recovered sufficiently from the daze of the blinding light to react promptly to his warning. Seconds later came the deafening crack of the blast, and a shock wave that splintered all the windows on both sides of the train. The passengers who had not dived under the seats were slashed mercilessly from waist to head by glass flying at bullet speed." Clearly, prompt 'Duck & Cover', upon any bright flash suddenly appearing, is lifesaving good news everyone should be taught! They need to also be taught, after the blast, attempting to outrun that downwind drift of the fallout is strongly discouraged. It only works if wind direction, speed, and distance from ground zero is known and assures plenty enough time to escape exposure in the open well before the fallout would arrive along their, likely clogged, route. They must also be taught, sheltering-in-place is usually the better option, as the radioactive fallout loses 90% of its lethal intensity in the first seven hours and 99% of it in two days. For those requiring sheltering from fallout, the majority would only need two or three days of full-time hunkering down, not weeks on end, before safely joining an evacuation, if even still necessary then. That's more good news as an effective expedient fallout shelter can easily be improvised at home, school or work quickly, but, again, only IF the public had been trained beforehand in how to do so, as was begun in the 50's, 60's & 70's with our national Civil Defense program. Unfortunately, our government today is doing little to promote nuclear preparedness and Civil Defense instruction among the general public. Regrettably, most of our politicians, like the public, are still captive to the same illusions that training and preparation of the public are ineffective and futile against a nuclear threat. Q: In the last four years, the most horrific scenario - a nuclear attack - may be the least discussed. If there were to be a nuclear attack tomorrow by terrorists on an American city, how would it be handled? A: In the area of a nuclear bomb, it's prevention, prevention, prevention. If a nuclear bomb goes off, you are not going to be able to protect against it. There's no city strong enough infrastructure-wise to withstand such a hit. No matter how you approach it, there'd be a huge loss of life. Mr. Chertoff failed to grasp that most of that "huge loss of life" could be avoided if those in the blast zone and downwind knew what to do beforehand. He only acknowledges that the infrastructure will be severely compromised -- too few first-responders responding. Civil Defense pre-training of the public is clearly the only hope for those in the blast zone and later in the fallout path. Of course, the government should try and prevent it happening first, but the answer he should have given to that question is; "preparation, preparation, preparation" of the public via training beforehand, for when prevention by the government might fail. The Obama administration also failed to grasp that the single greatest force multiplier to reducing potential casualties, and greatly enhancing the effectiveness of first-responders, is a pre-trained public so that there will be far fewer casualties to later deal with. Spending millions to train and equip first-responders is good and necessary, but having millions fewer victims, by having also educated and trained the public beforehand, too, would be many magnitudes more effective in saving lives. Maybe the Trump administration will do better, but time is short. The federal government needs to launch a national mass media, business supported, and school based effort, superseding our most ambitious public awareness campaigns like for AIDs, drug abuse, drunk driving, anti-smoking, etc. The effort should percolate down to every level of our society. Let's be clear - we are talking about the potential to save, or lose needlessly, many times more lives than those saved by all these other noble efforts combined! #3 - Continuity of the Public while it's happening - via proven mass media Civil Defense training beforehand that would make the survival difference then for the vast majority of Americans affected by a nuclear event and on their own from that first initial flash & blast and through those critical first couple days of the highest radiation threat, before government response has arrived in force. This deadly oversight will persist until those crippling myths of nuclear un-survivability are banished by the good news that a trained and prepared public can, and ultimately has to, save themselves. More training of the public beforehand means less body bags required afterwards, it's that simple. The tragic After Action Reports (AAR's), of an American city nuked today, would glaringly reveal then that the overwhelming majority of victims had perished needlessly for lack of this basic, easy to learn & employ, life-saving knowledge. Re-launching Civil Defense training is an issue we hope & pray will come to the forefront on the political stage, with both parties vying to outdo each other proposing national Civil Defense public educational programs. We are not asking billions for provisioned public fallout shelters for all, like what already awaits many of our politicians. We are just asking for a comprehensive mass media, business, and school based re-release of the proven practical strategies of Civil Defense instruction, a modernized version of what we used to have here, and that had been embraced by the Chinese, Russians, Swiss and Israeli's. There is no greater, nor more legitimate, primary responsibility of any government than to protect its citizens. And, no greater condemnation awaits that government that fails to, risking millions then perishing needlessly. We all need to demand renewed public Civil Defense training and the media needs to spotlight it by questioning officials and politicians, until the government corrects this easily avoidable, but fatal vulnerability. Then, post links to, or pass copies of, this 'Good News' article to friends, neighbors, relatives, fellow workers, churches and community organizations with a brief note attached saying simply: "We hope/pray we never need this, but just-in-case, keep it handy!" Few nowadays will find that approach alarmist and you'll be pleasantly surprised at how many are truly grateful. Everyone should also forward copies to their local, state and federal elected representatives, as well as your own communities first-responders and local media, all to help spread this good news that's liberating American families from their paralyzing and potentially fatal myths of nuclear un-survivability! Bottom Line: We could easily reduce by 90% the lethality of all Chinese, Russian, N Korean and Iranian missiles, and any terrorist nukes, too, quick as the public is trained up in blast & fallout Civil Defense basics again. And, that is very good news! in the event of disasters, especially terrorist attacks using dirty bombs or nuclear weapons. If you'd like to help with tax-deductible contributions to expand our "Good News About Nuclear Destruction..."
contact Physicians for Civil Defense. 7/17/2014 Press Release here. Together, we could save millions of American families from needlessly perishing in a future nuclear disaster!